You already know that it's the amount of money you keep, as opposed to the amount you earn, that matters in the end. Even more than any fees you may be required to pay, the biggest drag on investment earnings is usually taxes. And taxes may come in many forms, ranging from tax on ordinary income to capital gains tax to the 3.8% surtax on "net investment income" (NII)—and that doesn't include any state and local taxes. To minimize the strain, reassess your portfolio so that it emphasizes "tax awareness." That could mean focusing on what investments you own as well as where you hold them, in tax-deferred or taxable accounts. For instance, it doesn't make sense to load up on tax-free municipal bonds in a tax-deferred IRA that essentially wastes munis' special status. But an IRA could be a good place to hold other bonds or dividend-paying stocks which generate annual income that might otherwise add to your tax bill. 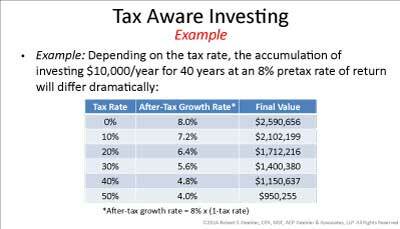 If you wonder how much tax-aware investing can really help, take a look at the attached chart. For simplicity, we'll assume that someone invests $10,000 a year for 40 years and generates an 8% pre-tax rate of return. The final value shows a high of more than $2.5 million for a "boring" person who stays the course and effectively realizes a 0% tax rate as compared to a low of less than $1 million for an "exciting" trader who buys and sells assets frequently and ends up with a 50% tax rate. The numbers don't lie. Ordinary income: The top federal income tax rate on ordinary income is 39.6. Ordinary income rates apply to investment interest, short-term capital gains, and the taxable distributions from IRAs and workplace retirement plans. Capital gains and dividends: Federal tax law provides preferential tax treatment for long-term capital gains on assets held longer than one year and for most dividends. While most taxpayers benefit from a maximum 15% rate (those in the two lowest tax brackets pay 0%), the rate increases to 20% for upper-income investors in the highest tax bracket. NII surtax: You now must pay a 3.8% surtax on the lesser of NII or the amount of your modified adjusted gross income (MAGI) that exceeds the threshold of $200,000 for single filers and $250,000 for joint filers. This surtax is added to your regular income tax liability, so you might pay an effective top tax rate of 43.4% on ordinary income and 23.8% on long-term capital gains and qualified dividends. 1. Increase investments in tax-favored assets. Some obvious choices include tax-free municipal bonds as well as real estate, annuities, life insurance, and other tax-advantaged vehicles, just to name a few possibilities. 2. Defer capital gains. When possible, defer large gains to years in which your overall income may be lower, or try to spread your tax liability over several years. For example, you might accept installment payments when you sell real estate. 3. Change how your portfolio is put together. Design it to accommodate both current and future needs. Typically, you should emphasize both asset allocation and diversification of investments. 4. Consider your after-tax asset allocation. Remember that it's what you keep, not what you earn, that counts. Incorporate this principle into your mix of investments. 5. Develop a tax-sensitive asset allocation. Be aware of how taxes will affect your investments. For instance, factor in capital gain taxes and the 3.8% surtax on NII. 6. Manage your tax brackets from year to year. Do your best to stay below the thresholds for triggering a higher tax rate. Push income into low-tax years and pull income from high-tax years. 7. Manage capital gain holding periods. Remember that the preferential tax rates apply to gains from capital assets held longer than one year.